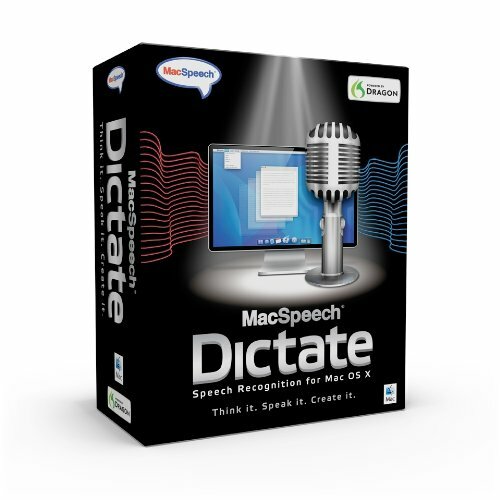 Welcome to the brand new MacSpeech Dictate, the premier speech recognition solution for the Macintosh. Written from the ground up for the Mac, MacSpeech Dictate’s features, accuracy, and capabilities make it as fun, productive, and intuitive to use as the Mac itself. The all-new MacSpeech Dictate provides: Amazing Accuracy. MacSpeech Dictate will astonish you with its accuracy. You simply talk and leave the recognition to MacSpeech Dictate. Minimal Training Required. MacSpeech Dictate provides astounding accuracy and productivity. With just five minutes or less of training, you’ll be using MacSpeech Dictate’s superior capabilities. Essential Command Capabilities. Instead of using your mouse to select menu commands or your keyboard to type shortcuts, just speak a command. MacSpeech Dictate executes it for you. What could be easier. Uses the Legendary Dragon Speech Recognition Engine by Nuance. At the core of MacSpeech Dictate is the world-renowned Dragon speech recognition engine by Nuance. It’s the brains and brawn behind MacSpeech Dictate’s phenomenal accuracy capabilities. Works With The Apps You Already Have. Microsoft Word, Adobe Photoshop, QuarkXPress, and more. And MacSpeech Dictate works great with Apple’s applications as well, including iChat, Mail, iPhoto, Keynote, and more. Comes With Everything You Need, Including Headphones. There are no hidden costs. MacSpeech Dictate includes everything you need to be instantly productive as soon as start using it, including a high quality headphone/microphone unit. Built Especially For The Mac. Mac users expect only the best from the applications they use on their Macs. MacSpeech Dictate was built from the ground up to ensure the ultimate experience for Mac users.System Requirements. 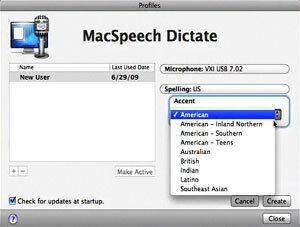 Intel-based Mac, Mac OS X 10.4.11 or greater “Tiger”, Mac OS X 10.5.1 or greater “Leopard”, Internet connection required for product registration., Internal microphone is not supported.Welcome to MacSpeech Dictate, the premier speech-recognition software for the Macintosh. With MacSpeech Dictate, you’re free to focus on what you have to say–just think it, speak it, and create it. Instead of typing, use your voice to input text; rather than clicking your mouse, just speak commands. MacSpeech Dictate executes it for you. What could be easier? Written from the ground up for the Mac, MacSpeech Dictate’s accuracy and capabilities make it as fun, productive, and intuitive to use as the Mac itself. Premier speech-recognition software for the Macintosh. 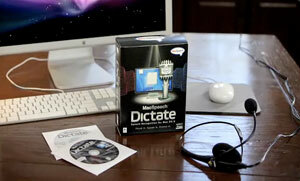 MacSpeech Dictate will astound you with its accuracy rate–near perfection with up to 99% accuracy. You simply talk and leave the recognition to MacSpeech Dictate. MacSpeech Dictate never misspells a word–typos are a thing of the past. MacSpeech Dictate boasts robust Phrase Training capabilities, allowing it to learn as it goes based on your voice input. Even more, MacSpeech Dictate recognizes and understands 13 distinct English dialect variations, nine with U.S. spelling and four with U.K. spelling. MacSpeech Dictate provides astounding accuracy and productivity. With just minutes of training, you’ll be using MacSpeech Dictate’s superior capabilities. Recognizes 13 distinct English dialect variations such as American, British, Australian, and more. Instead of using your mouse to select menu commands or your keyboard to type shortcuts, just speak a command. MacSpeech Dictate executes it for you. What’s more, MacSpeech Dictate understands key commands. With the ‘Press The Key’ and ‘Press The Key Combo’ commands, you can enter specific keys and even keyboard modifiers like Command, Option, Shift, and Control. That makes you more productive and MacSpeech Dictate more intuitive. What could be better? MacSpeech Dictate works great with most text documents, even those it didn’t create. MacSpeech Dictate can read a document’s contents, or a portion of it, that you can then navigate and edit. Microsoft Word, Adobe Photoshop, QuarkXPress, and more. And MacSpeech Dictate works great with Apple’s applications as well, including iChat, Mail, iPhoto, and Keynote, among others. 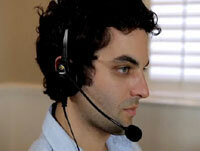 MacSpeech-certified, noise-cancelling microphone headset included. You don’t need a keyboard or mouse to move around in your documents. MacSpeech Dictate lets you move your cursor forwards, backwards, and much more with just your voice. It helps make editing your documents a breeze. MacSpeech Dictate’s spelling mode lets you easily spell words, names, and acronyms with either natural language or the International Radio Alphabet. You have complete control over every aspect of your speech recognition input. MacSpeech Dictate includes everything you need to be instantly productive as soon as you start using it, including a high-quality headset microphone. Equipped with the world-renowned Dragon speech-recognition engine by Nuance. For those times when you need a little assistance, MacSpeech Dictate boasts a complete online, searchable help book. It’s convenient to use, easy to understand, and all just a mouse click away.